Duke Nukem 3D Reloaded, an Unreal-powered remake of Duke Nukem 3D, is on hold following what sounds like a dispute between the mod makers and Gearbox. Released in 1996, Duke Nukem 3D is one of the greatest first-person shooters of all time, good enough to keep hope and money for a sequel flowing for 15 years - but that's another story entirely. This story is about Duke Nukem 3D: Reloaded, an Unreal Engine 3-powered remake of the classic game that got the official green light from Gearbox last year. But now, in the finest tradition of 21st-century Duke, things have hit a snag. 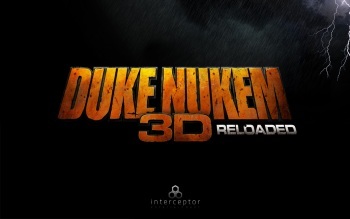 "After careful consideration of the progress and direction of the project, Interceptor Entertainment has decided to finish Duke Nukem: Reloaded at a future date that is yet to be determined," Project Lead Frederik Schreiber announced on DukeNukemReloaded.com. "Interceptor Entertainment still has the good will and non-commercial license provided to us to use the Duke Nukem brand for our creative ambitions. We hope to resume that work again when the time is right." But despite that "good will," the delay is apparently rooted in the non-commercial license granted to the Reloaded team, which seemingly allows the game to be made but not necessarily released - at least not without some unknown strings attached. "You have to remember, that we don't own the game. Its done under a signed license with Gearbox Software. Which ultimately means, that we cannot do whatever we want with the project," Schreiber wrote. "Its not really up to us. We have had a long conversation with Gearbox about this matter. And the fact is, that we are bound by a license. A license of an IP owned by Gearbox Software. And we can't do much about it," he continued. "But there are some conditions which we can't live with, with our license and agreement. And because of this, we have decided to put the project on hold. This might change in the future - it all depends on what Gearbox decides to do, after the DNF DLC has been released." Schreiber clarified in a separate post that the decision to suspend development was ultimately Interceptor's, not Gearbox's, and that it had nothing to do with money. "We don't care about either official releases, Steam or any other services," he explained. "We just care about getting the game in the hands of our fans - and the license didn't allow for that. Its as simple as that."